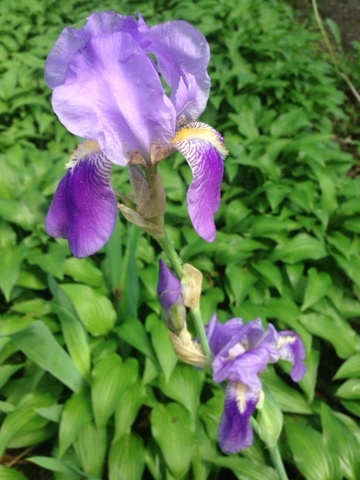 With spring in full swing, the three-day weekend was glorious. Because I have feet problems, I have to plan cooking carefully so that I have time to break up the standing. 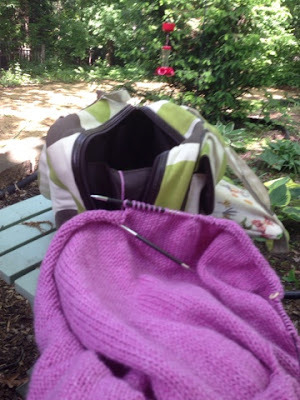 It was a perfect weekend for knitting breaks in the back yard. I did get out for a bike ride and headed east. The UW campus is beautiful. This is the Historical Society Library, where I did all my master's research a long time ago! And we had a family gathering on Memorial Day! I'm just mad that I forgot to take pictures. 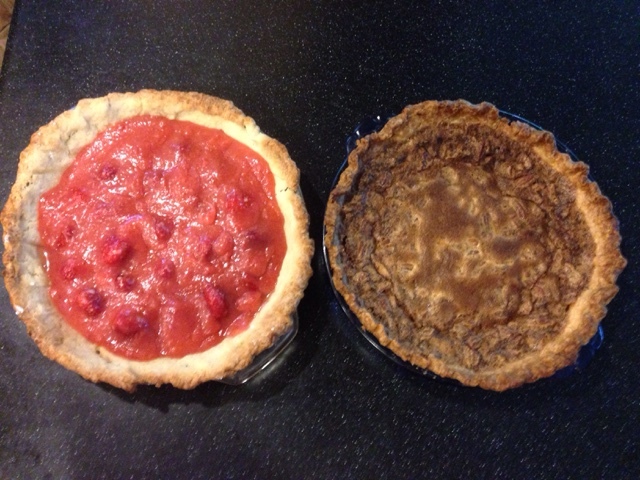 That's a strawberry pie on the left and a pecan pie on the right. I could live on pie! Are you a pie eater? Thanks so much for all the encouraging words on embroidering a face. 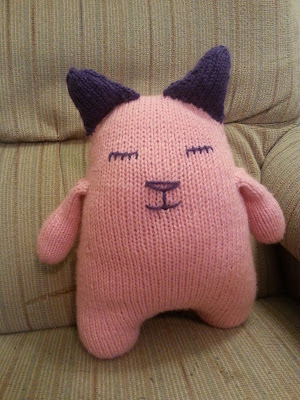 I used the same type of yarn, Encore, in purple to match the ears. I think it came out quite well. I got the face embroidered fairly quickly by just making it up as I went, but I was stumped for days on how to secure the ends. 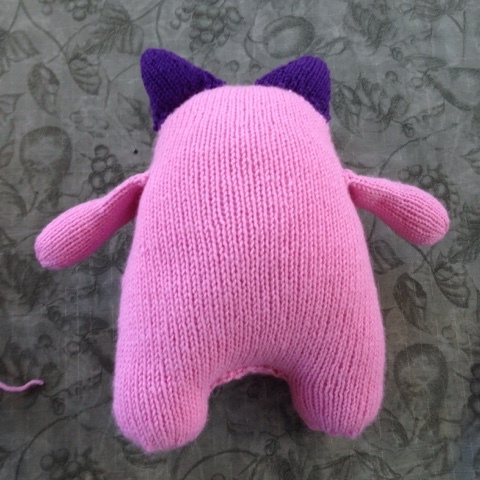 Luckily I had used a very long piece of yarn so I was able to pull it to the back and make a tail! 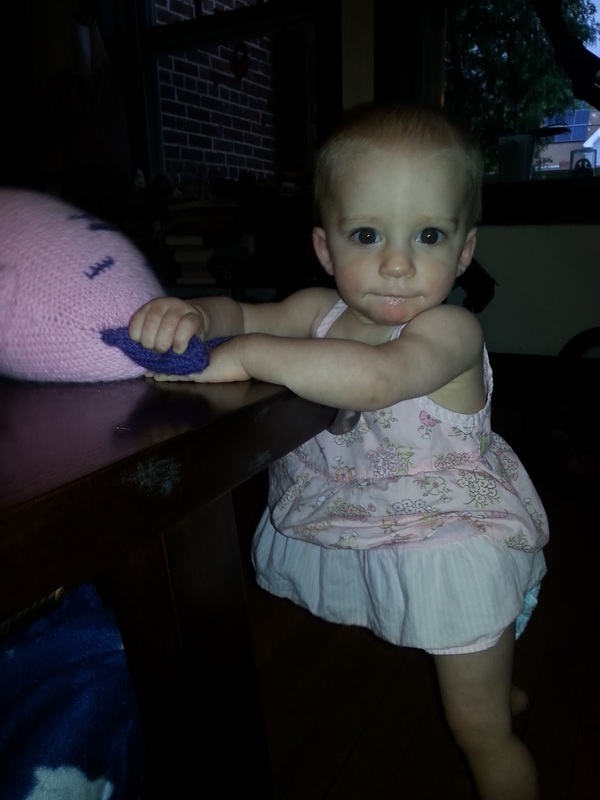 And here is an even cuter face: Toddler M with her new toy. Her birthday party was Friday night and it was quite the celebration. It's hard to believe it's been a year since she was born. She has many, many "grandmas" because most of my friends don't have grandchildren yet. Lucky little girl! And lucky us for have her to enjoy. Am I going to ruin it when I embroider the face? 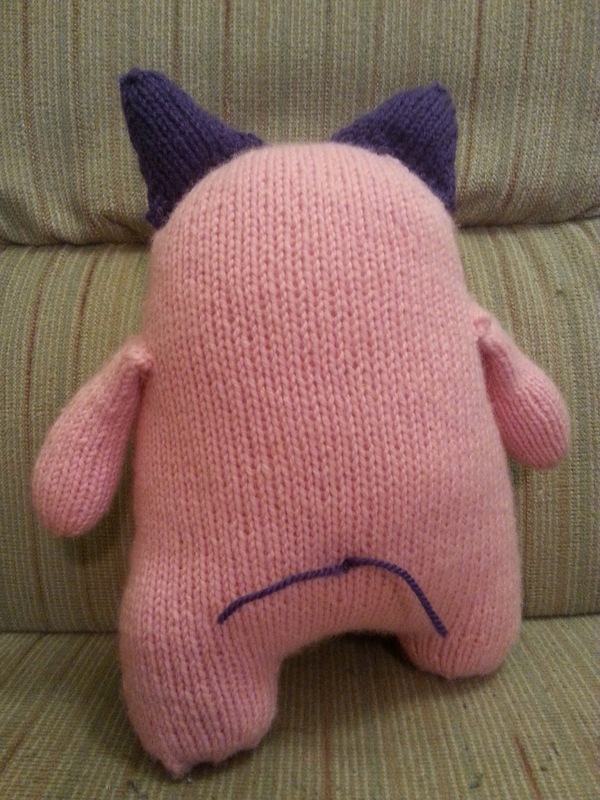 In her book, Rebecca Danger uses doll eyes, but this is a gift for a one-year-old so I'm going to embroider a face. I've never done this and I have no idea what I am doing. I'm just going to have to take a deep breath and dive in! I'm reading The Invention of Wings by Sue Monk Kidd. It's a historical novel about the early abolitionist, Sarah Grimke. As a history buff, I am picky about historical fiction. I'm on page 70, and I'm not impressed yet. I'll be joining Ginny for Yarn Along today. 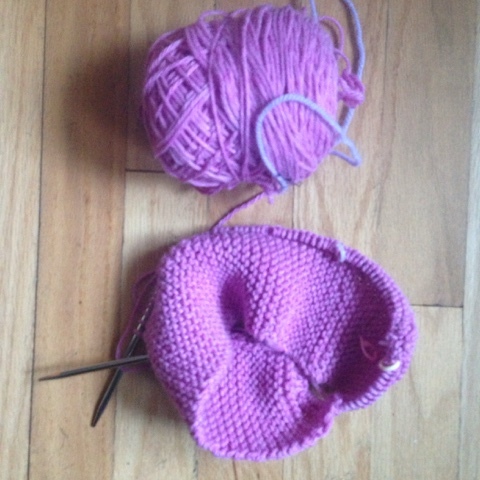 I'm making it out of Cascade 220 in a pink heather, and I'm liking the color. 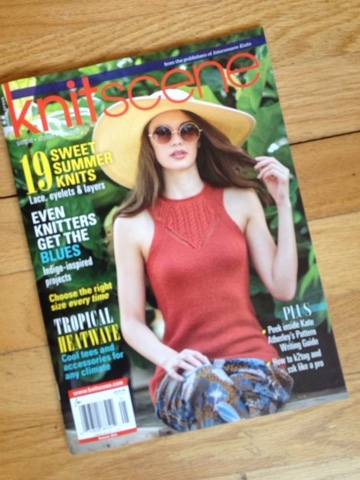 That's a good thing because I have a lot of stockinette ahead of me! It was a good weekend of times with friends and family. Seth has finished the second year of vet school and is volunteering with a vet this summer, so I hope to see more of him. And there are just three more weeks of school -- not that I'm county. 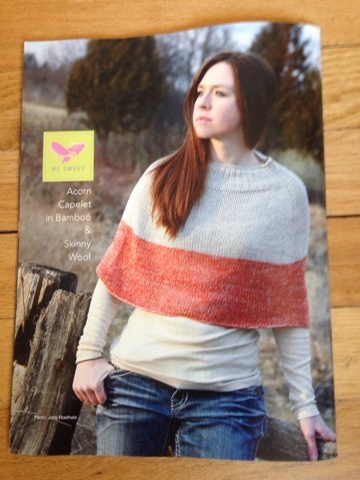 I won't feel like real knitter until I make a sweater that I can wear. I've tried a few times and the results were disastrous. 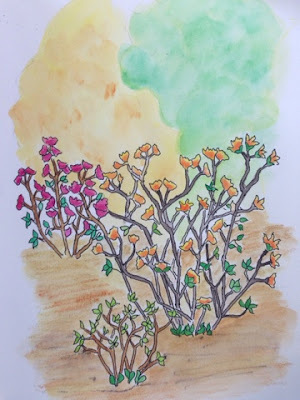 Last week, I read a post (and I am so sorry that I can't remember who's blog it was on) singing the praises of Harvest. It is a Tin Can Knits sweater designed for the rank beginner. 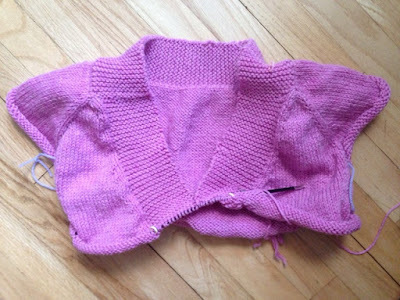 So, I cast on this weekend using a Cascade 220 heathered pink. So far, so good. I know it's ridiculous to start a warm sweater in May, but I have to take advantage of my current inspiration. Wish me luck! I'm about 80 pages into it, and I am completely immersed in this contemporary story about Baker Towers, the Pennsylvania mining town featured in the earlier book. 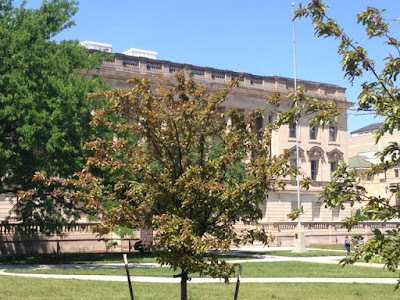 It is set around the issue of fracking and how that affects various members of the community. 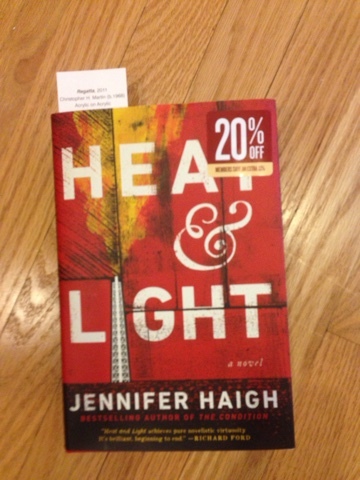 It's a much more ambitious novel than Baker Towers and so far Haigh is pulling it off. I'll be joining up with Ginny for Yarn Along. If you walked into my house, you would think it's in reasonably good order. But when I look through the rooms from the perspective of putting the house on the market, I see clutter and little repair jobs all over the place! We definitely want to sell the house in 2017, and I feel like that barely gives us enough time to get it ready. Especially these days, when staging is everything. When I bought my first house, people just picked up. Now I feel the need to really cull and clean. The yarn is Plymouth Fantasy Naturale, which makes a nice, dense fabric and comes in great colors. 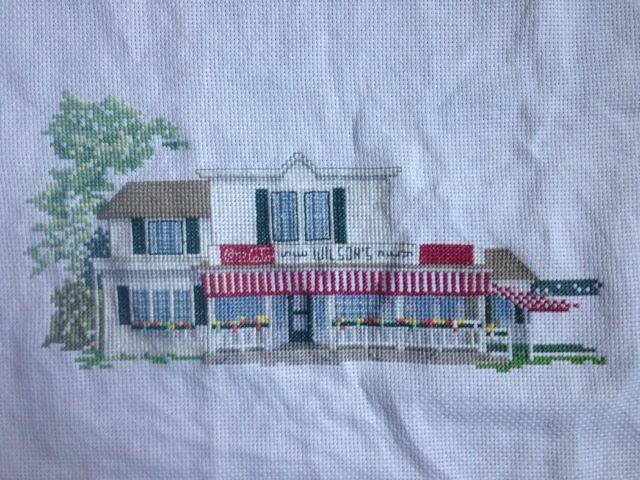 And I added a few stitches to my Door County cross stitch. I love the way it is coming out, but I am discouraged by how much more there is to do. 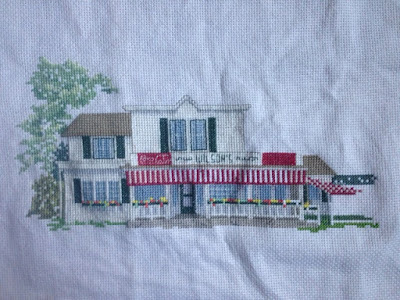 I am almost done with the building, but there is a ton of foliage ahead of me. Clearly I'm not the only person who loves magazines. Look at the magazine section at Barnes & Noble. It is jam-packed. And craft magazines are the best! They make for perfect eye candy. And I get so much inspiration from them. 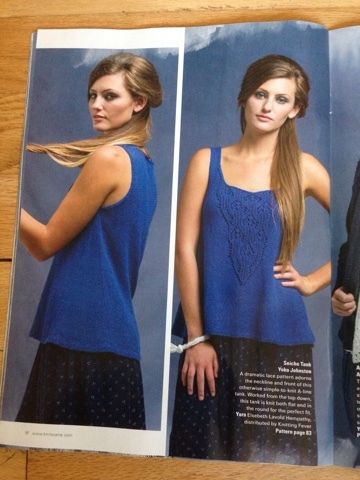 However, there is a tank top inside that I think I could pull off -- if I were a good-enough knitter. I wonder if you can own too many ponchos? I have two right now and I love them. Have I mentioned that we keep our house at 62 in the winter? 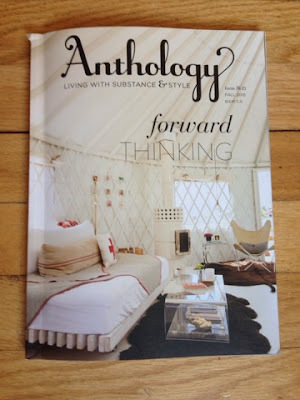 Another magazine I really love is Anthology, which is decorating/lifestyle magazine. 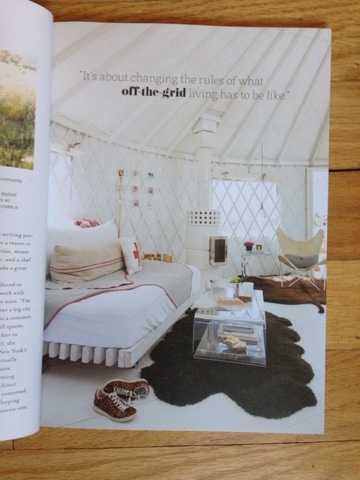 A couple weeks ago, I found this issue on sale at Anthropologie. What magazines do you love? Is already Wednesday again? The weeks are going faster as we get closer to summer break! I'll make it quick today because I need to get to work early this morning. It's a Tin Can Knits pattern from the book Handmade in the U.K. Of course it's well-written and fun to knit, but I don't think you can appreciate how clever the pattern is until I can actually model it. It does feel good to pick up a project that's been languishing! 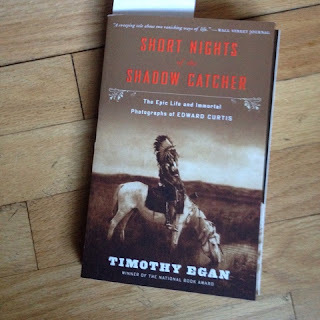 As for reading, I'm still enjoying Short Nights of the Shadow Catcher by Timothy Egan. This guy can really write! This could be a very dull story in another writer's hands. But Egan brings to life the early years of the 20th century when Edward Curtis was trying to photograph Native Americans before their culture was completely obliterated. I hope your week is zipping along! Don't forget to join Ginny for Yarn Along! 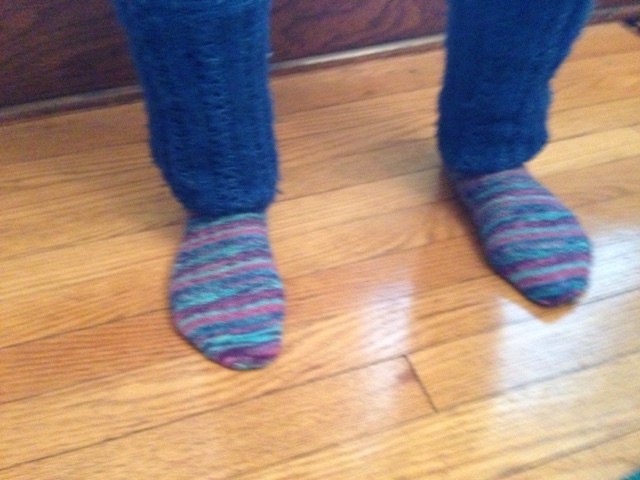 I knit. I bet you do, too! I've been bogged down by extra paperwork and cold, rainy days. But it is nice to come home and curl up with a cup of tea and an easy project. As a result, I've made pretty good progress on my Dot the Dress-Up Box Monster. Pretty soon, I'll be kitchnering the the top of her head. I think that they'll be great gifts. The problem is that I want to keep all of them! I'm thrilled that some days are warm enought that we can use the three-season porch. This afternoon Naji looks like he wants the room to himself! 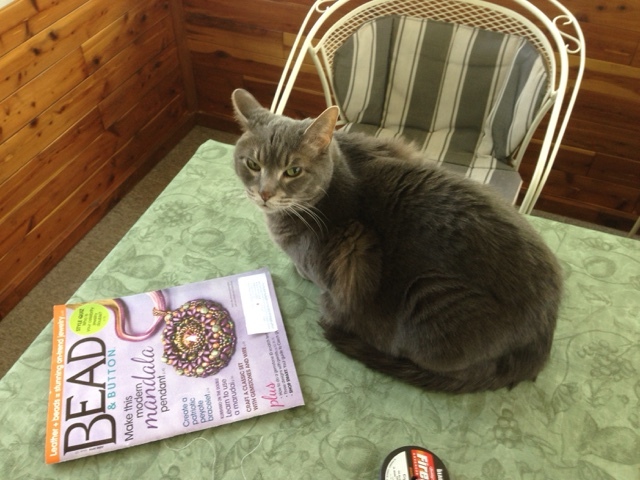 Perhaps he just doesn't want to share the magazine. A week ago, my plan was to finish a shawl I started in 2013. Well, you know what they say about the road to hell... That project was put back into hibernation because Baby Ma'ayan turns 1 at the end of the month. I really MUST knit her a gift, don't you think? So I've cast on -- even though I said I wouldn't -- for something new: a monster from The Big Book of Monsters by Rebecca Danger. 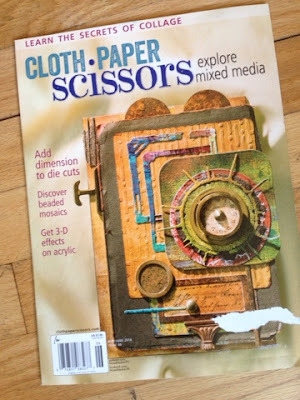 I've checked this book out of the library a number of times; finally I have an excuse to try making one of the projects. 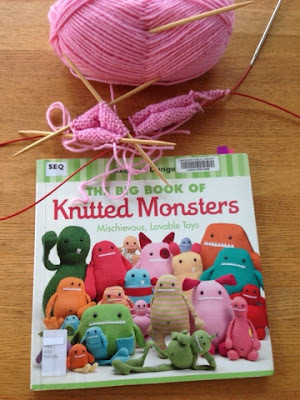 Danger recommends that you knit her monsters using magic loop, a technique that, frankly, terrifies me. But I have always wanted to learn how to do it -- I love the idea of knitting two socks at once! -- so I'm taking the plunge. I have managed to start the first leg on dpns, as instructed, and slip it onto the circular needle. 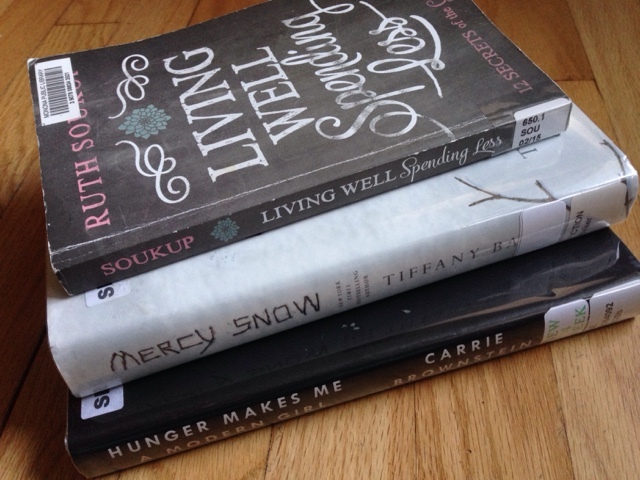 I've also scratched all the books I was looking at last week. 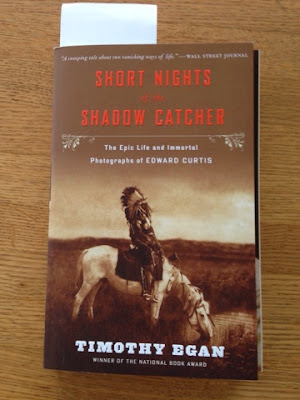 Instead, I'm reading Timothy' Egan's Short Nights of the Shadow Catcher, the story of Edward Curtis, the photographer who made it his mission to get photos of the disappearing Native American peoples. Egan, famous for his book about the Great Depression, is truly a great writer. The first couple chapters were fascinating. Hunger Makes Me A Modern Girl by Carrie Brownstein. I love Brownstein in her Portlandia role, but her autobiography just didn’t grab me. I’m sure someone who is younger and loved her band (Sleater-Kinney) would find it fascinating. A Spool of Blue Thread by Anne Tyler. I loved her first six or seven books, but haven’t liked any of the later ones. The writing in Chapter 1 of this book is downright amateur. She uses conversation quite awkwardly to convey background information. I didn’t get very far before I slammed this one shut. Mercy Snow by Tiffany Baker. First, let me say that this book involves knitting! It’s actually a pretty decent read for a piece of popular fiction (yes, I’m a bit of a snob). I just wasn’t in the mood for it. Join me in checking out what everyone else is knitting and reading this week with Ginny's Yarn Along. It was gray weekend, but I'm not complaining because I had a lot to do to get ready for two upcoming exhibits. Besides, there were enough breaks from working to make it seem like a weekend. Friday night Keith and I had dinner with my parents. It was Greek Night at their community and the food was quite good. 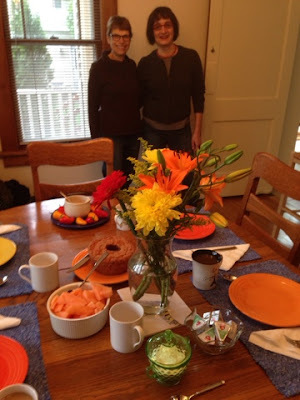 This morning my friend Marsha had a little gathering at her house. Marsha, left, had a very color-coordinated table today. Next to her is Tsela. 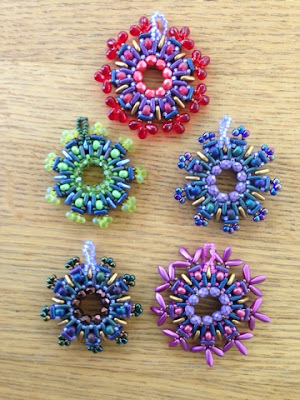 On Saturday, Tsela and I made pendants from a recent Bead & Button magazine. 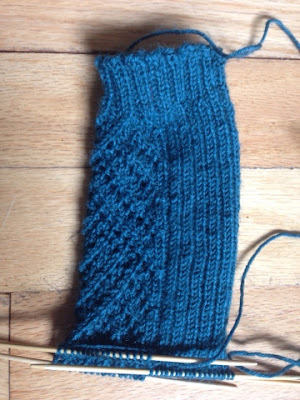 This pattern is a bit tricky, but I figured it out in the end. Tracking down all the supplies was actually the hardest part. There are all these new shaped beads and no local store carries all of them. I'm happy with how it turned out. This photo doesn't do justice to the colors. It's mostly blues and purples, with some gold accents. 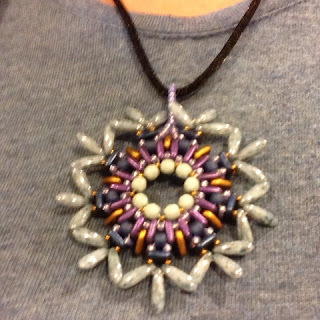 I'm sure I'll make a few more. 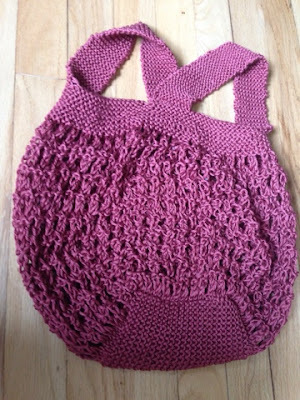 I have searched Ravelry and cannot find the name of this market bag. 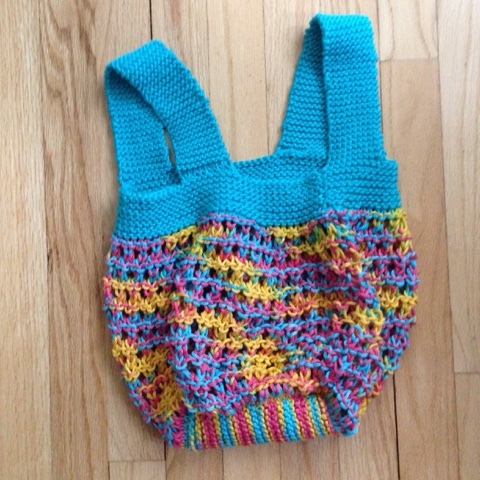 It's a quick knit and cute, so I'd like to share the pattern! 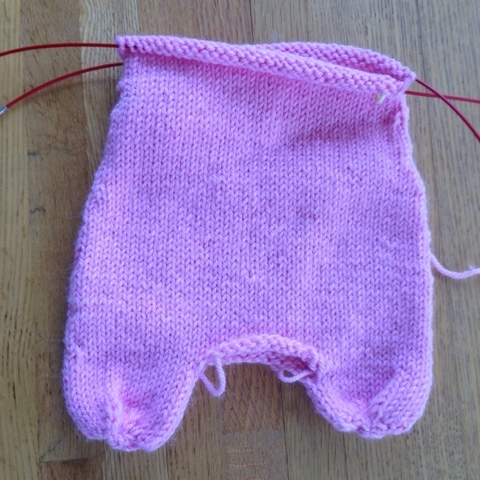 And here is one of those little projects that got lost in the shuffle for the months, waiting to be seamed. 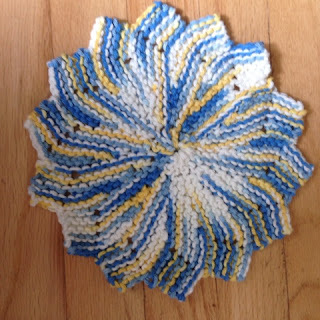 Just another washcloth to put in the gift box. I like quiet weekends like this. During the school year. I need to recharge and get a few things done before plunging back into another week.